2015 preseason trout stocking well underway despite challenging winter conditions Connecticut’s Department of Energy and Environmental Protection (DEEP) is reminding anglers that recent changes to sport fishing regulations included moving the date of Opening Day of trout season forward by one week, from the third to the second Saturday in April. This means Opening Day for the 2015 season is April 11. “Additionally, most of the state’s school-age anglers will also now have the opportunity to fish for trout during their spring breaks, as Opening Day will now come at the beginning of that school vacation for most school systems in Connecticut,” said Klee. DEEP reminds School-age anglers ages 16 and 17 that they can obtain their 2015 Fishing, hunting and trapping licenses at 1⁄2 the adult price (most hunting permits, stamps and tags will also be 1⁄2 price for 16 and 17 year olds). 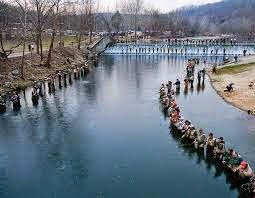 DEEP expects to stock over 341,000 trout in waters across the state in time for Opening Day of the 2015 trout fishing season April 11th. Nearly 100 lakes and ponds and 190 rivers and streams are scheduled for stocking. The very cold temperatures, prolonged heavy snow pack and icy conditions have been challenging for DEEP stocking efforts. Trout anglers looking to test out their gear prior to the start of trout season can visit one of the state’s fifteen Trout Management Areas (TMA), all are open for pre-season catch-and- release fishing. While many of the TMA’s have yet to be stocked, they should all have reasonably good fishing from fall trout stockings. So far this spring, the Farmington River (above and below the year-round catch-and- release area), Hockanum River, Naugatuck River, Sleeping Giant (Mill River, Hamden) and Willimantic River TMAs have been stocked. Other TMA’s scheduled for stocking before Opening Day are located on the Hammonasset River, Hockanum River, Mianus River, Mill River (Fairfield), Moosup River, Pequabuck River (including Coppermine Brook), Salmon River, Saugatuck River and Yantic River. 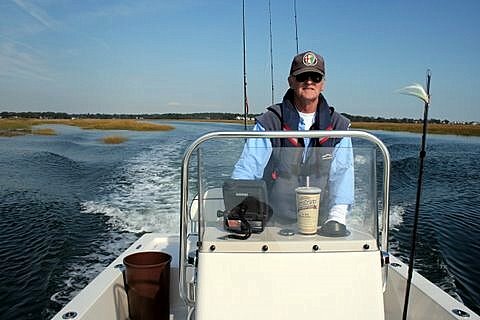 Anglers can access up-to-date information about where and when trout are stocked on Facebook at www.facebook.com/ctfishandwildlife. Anglers should consult the 2015 CT Angler’s Guide for detailed information on specific locations and angling regulations. Printed versions of the 2015 Angler’s Guide are now available at more than 350 locations statewide, including town halls, bait & tackle shops and other vendors selling outdoor equipment, DEEP facilities, and commercial marinas and campgrounds. Anglers are advised that there are several errors in the print version where the date for Opening Day was not updated to reflect the recent change in Opening Day from the third Saturday in April to the second Saturday in April. The electronic versions of the Guide can be found on the DEEP website at (www.ct.gov/deep/anglersguide) and have been fully corrected. Additional fishing and fisheries related information can be found on the DEEP web site at www.ct.gov/deep/fishing. The web site has a wealth of information including; trout stocking location maps, annual fish stocking summary report, the very popular Youth Fishing Passport Program, and when you catch the big one, criteria for Trophy Fish Awards. Save the last minute running around and purchase your 2015 fishing licenses directly online, or if you prefer, at one of the many participating town halls, tackle retailers and DEEP offices. For a complete list of vendors, visit the DEEP website (www.ct.gov/deep/fishing) or call DEEP Licensing and Revenue (860-424-3105).